Things look blurry, right? There are lots of stuff that you need to take care of. Family on the one side and business on the other side - both of them screaming for your attention 24x7. You are unable to make the two ends meet. You really want to “make it” in your business - but you get interrupted by a lot of responsibilities. I’m not saying this to scare you, but let’s face the truth. If you are working from home, chances are that you have experienced all of the above. In the end, it seems like an endless struggle. You neither make it in your business, nor do you have that wonderful family time and relationship you long for. 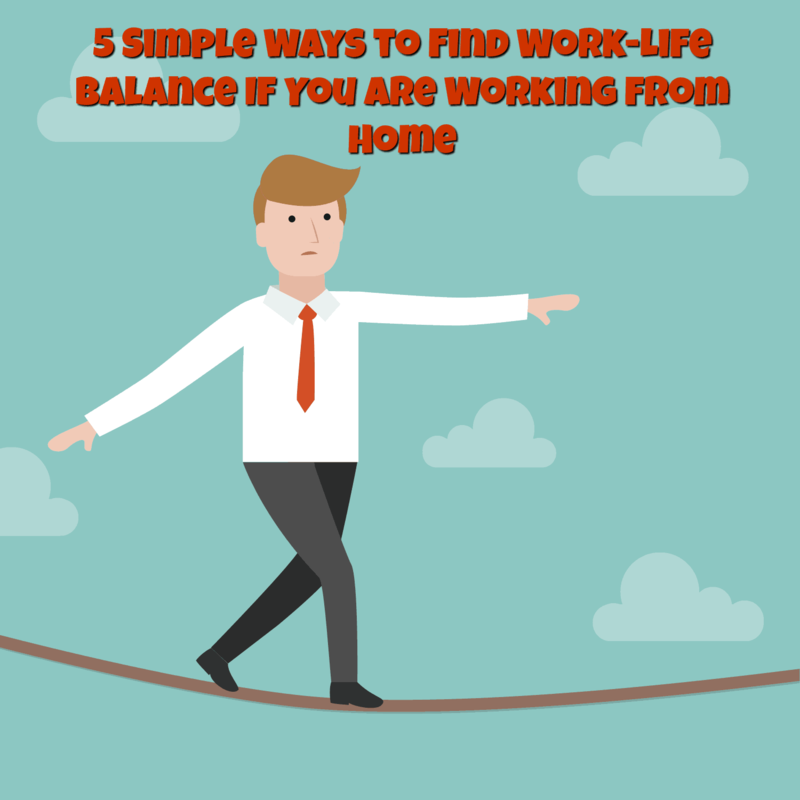 In fact, most entrepreneurs quit the 9–5 and decide to start working from home mainly for the sake of their family; but in the end, working from home seems almost equivalent to the 9–5 where you still struggle to find that work-life balance. If you really want to enjoy the true benefit of working from home, you need to find that work-life balance. And here are 5 key things that you absolutely need (no excuses) to make that happen. Let’s get started! Most of the times, your lack of definition of work results in chaos. It is quite natural to fall in the trap of “work” when you work from home. If you do not clearly know what’s work and what’s not, your struggle to make it happen with your business will last forever. First, you must clearly know what work is and you should also make your family clearly know about it (more on this later). Sitting on your table in front of your computer doesn’t necessarily mean work. Work is when you do something today to move the needle that can make a big difference to your business progress. Anything you do to proceed forward with your business is work. Anything else is simply NOT work. So if you are sitting in front of your laptop for 10 hours a day, and yet, nothing gets accomplished, you are certainly not working. So what else did you do? You probably were distracted by social media. Or you got caught up in time killing silly activities (that do not contribute to any progress in your business). Or you took too much time in handling emails - whatever! You are the one who can figure out what is real work when it comes to business. Social media is important for certain businesses - I can even say that it is inevitable. But that doesn’t mean you should spend 4 hours a day on Facebook and Twitter. Once you define work, it will be easy for you to be super focused on your business. And you can also get a lot of things done as planned. … Which means more family time! Although this seemed to be a very vague concept to me, now I understand its importance. What is staying in the present? It is giving your “100%” to whatever you are doing. Sounds simple? Yes. But this makes a BIG difference! Let me share my own experience here. My hubby leaves to office at 7:30 am and my son leaves to school at 8:15 am. Now this means, I have to wake up at 4:45 am to pack lunch and get breakfast on table (plus help my son to get ready to school). It will be a hectic time for me until both of them leave. Earlier I used to switch on my laptop at 5 am, and peep into my work (like clearing emails, catching up with writing blog posts etc.) while cooking at the same time. That period will be super-hectic for me as I try to juggle between tasks. I either ruin the dishes or the content I write at that time would sound so unprofessional. Plus I would have added a lot of stress into my system, right in the morning - which certainly has its effects on my energy and mood throughout the day. I used to feel a lot exhausted once they leave and all I want is to take a nap. I would feel tired and sleepy for the rest of the day. My productivity would take a big hit. And then I sat one day and just gave this a thought. Why am I being so hard on myself right in the morning? I then decided to practice “being in the present”. This means, when I am cooking, I just cook and no peeping into my laptop or phone. When I am playing with son, it is just playtime. When I am helping him with his homework, I just do that. When I am having a conversation or personal time with my hubby, it is just that (and no phone or laptop). And when it is time to work, it is just work time and NOTHING else - no compromises. Once I figured this out, I feel a lot calmer, organised, focused and productive. I know this sounds like a silly, stupid thing - but trust me, you have to try it out and see the results. Work-life balance heavily relies on YOU drawing that fine line between work and life. If you treat both like they’re one and the same, you lose. If you do not differentiate work from life, it will be almost impossible to find that balance. While it could be important for you to work at all times, you should have dedicated working times - and family time. If you mix up the two, you will suffer. You should have dedicated office hours even if you are working from home. And you should not mix up both family time and work time. If you are on a vacation, it is OK to have a laptop in your hotel room and work once in a while. But if you are connected to your phone and laptop 24x7, your family won’t be happy apparently. If you learn to draw this fine line, both your family and your clients will be happy! No doubt! This one is super important! You need to communicate things - as is - to your family and to your clients, staff and anyone involved in your business. For instance, if you are going to launch a product in a week and hence if you have to work extra hours until then, clearly communicate this with your family. This way you can avoid unnecessary expectations and commitments during that time. Your family will also be supportive with your launch. Likewise, if you are going to go on a vacation for a week, or if you have a family occasion, clearly communicate this with your staff and clients so they don’t expect you to pick up calls or instantly respond to emails during those time. Without communication you cannot expect things to run smooth on either side! Be it family or business or your personal self, appreciation goes a long way. Take time for this mostly ignored task. In our busy schedule, we often forget to stop by and notice all the nice things - let alone appreciate them. But appreciation acts as motivation and hits you back with lots of positivity. Appreciate your spouse and children for their understanding. Appreciate them for being so nice and supportive to you with your business. Appreciate your staff for helping you run the business successfully. Appreciate your clients for their understanding and cooperation. It comes back to you as a boomerang with more positivity. Your family will be encouraged to understand and support you more with your business. Your staff will be motivated to work even hard and help you get things done. Your clients will understand that you care for them and be more cooperative with you. Again, you have to try this simple thing out to see how great this works! It is so crucial for your own self in the first place. Without finding that balance you will be all stressed out. It can ruin your business performance. It can even ruin your relationships. But once you get these 5 key things in place, I assure you that things will run smoothly. And you will be at peace, having more energy to simply focus on what’s important at that moment. Talk about succeeding in business and life. This is something I strongly believe and work for. I am not willing to sacrifice my business for personal life and vice versa. So good luck with finding that work-life balance. Jane shares brutally honest blogging tips at Savvy Blogging Tips.Visit her blogfor business, blogging and productivity advice. If you are into starting an online business blog, grab her free course -Blogging Success Foundation!